Most world-class ballet dancers, from the tender age of four or five, have been taught to hold themselves in a certain way, with a certain posture. They practice and practice their ballet posture until it becomes second nature. Unfortunately, this way of carrying themselves gets misinterpreted thousands of times a day as snobbery, from fast-food joints to street corners worldwide. The fact is, many ballet dancers are rather shy about what they do. (You would be, too, if everyone mistook you for a snob.) But the ballet stance that inspires this misconception is a basic part of classical ballet technique, for men and women alike. Don’t worry, though — if you’re old enough to read this, you are in no danger of having this stance become permanent. You’ll be able to turn it on and off at will. One of the big goals of ballet is creating the illusion of elegance and poise. A certain confident ease of motion perpetuates this illusion. But that’s exactly what it is — an illusion. Deep down, every ballet dancer is just as neurotic as you are. If you were to videotape a world-class ballet dancer in action, and then stop the tape at any given frame, the ideal dancer will always appear graceful and balanced. This remarkable phenomenon applies to other pursuits as well — tai chi, for example, or thumb wrestling. 1. Stand at the mirror, facing sideways, with your feet parallel to each other. 2. Engaging your thigh muscles, straighten your knees — but without pushing back into your knee joints. 3. Lift your abdominal muscles upward and back towards your spine. This is called pulled-up position. Imagine that you are placing your ribcage over your hips. Think of your neck as an upward extension of your spine. Your shoulders are relaxed downward, and your chin is slightly lifted — hence the haughty air. 4. Curve your arms so that they are rounded and just in front of your thighs, and bring your weight forward into the balls of your feet. You should be able to lift your heels slightly off the floor (see Figure 1). At first, you may feel as if you are about to fall forward onto your face. In fact, go ahead and give yourself permission to fall forward a few times. But with practice, this alignment becomes much more natural. Now that you have found your placement, or center, you are ready for anything. All ballet movements begin from here, allowing the upper and lower sections of your body to work together as one. 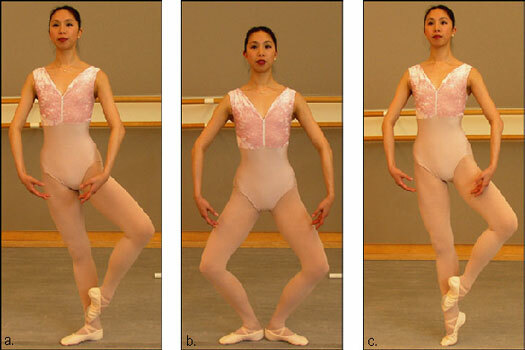 Figure 1: Finding good placement for ballet technique. In addition to aligning your spine, you need to be able to adjust your posture for different ballet positions. In order to maintain balance while your legs and hips move in a certain direction, your upper body moves in opposition to your lower body. For example, say that you want to lift one leg behind you. In order to maintain balance, the weight of your upper body has to adjust slightly forward. When lifting your leg to one side, you adjust your body slightly to the other side to create balance. When lifting your leg to the front, you adjust your body slightly to the back. Got it? Of course, these adjustments are very small. But the smallest adjustments make all the difference and lead to safe dancing. When finding your center, you have to transfer your body weight a little forward, onto the balls of your feet. From this position, if you want to lift one leg off the ground, you must shift your weight more to the standing leg for solid balance. Start with your heels together, toes pointing outward. Keep your arms at your sides, low and rounded, with your fingers almost touching your thighs. Now shift most of your body weight to the balls of your feet, while keeping your heels down. Lift your left leg off the ground, bending your knee outward slightly. Now, pointing your left foot, place it in front of your right ankle (Figure 2a). Notice how much you must shift your weight to your right foot to maintain your balance. Figure 2: Shifting your weight to create balance. Now return your left leg to the starting position and repeat this exercise on the other leg. Begin by bending your knees as far as you can while still keeping your heels on the floor (Figure 2b). Lift your left leg, just as you did in the preceding section, bending your knee outward. Point your left foot and let the toes touch your right ankle as you straighten your right knee. Bring your arms in front of you, rounded at the level of your ribcage. The goal — eventually — is to arrive in this position with your arms and legs at the same time. Notice that the weight shift to the ball of your right foot is more extreme than before. That’s because your right leg has gone from bent to straight. After you master this shift, do the movement on the other side. You don’t want to develop a lopsided technique! Here’s the ultimate test in the transferring of weight. This exercise is similar to standing on one leg, but with a twist — this time, you balance not just on one foot, but on the ball of that foot. Now here’s the really tricky part: As you straighten your right leg, put your weight onto the ball of your right foot (Figure 2c). Caution: Don’t fall! You may need to hold onto something as you practice this weight shift. To balance in this position, you must send your weight way over to the right — but without leaning. Finding out exactly how much adjustment to make is a matter of practice. That, by the way, is one of those understatements that applies to the entire art of ballet. Don’t be dismayed if you don’t get the hang of it right away — it takes a lot of practice. And don’t worry if you find it much harder to balance on one foot than the other. Everybody has that problem. Keep in mind that when you go to the ball of your foot, your balance must be very precise. After all, you’re balancing the entire weight of your body on about 4 square inches. It’s like trying to hold up a broomstick by balancing the end in your upturned palm. It may take a very long time to find the balance — with the help of strong abdominal muscles to keep yourself stabilized. But when you do find that balance, it feels effortless. And that’s the most glorious feeling in the world. The strange thing is, with the right adjustments, you can balance in any position. So here’s the bad news — although you may find a balanced position, the position may not be “correct” in the classical sense. That’s why every ballet studio is plastered with mirrors from floor to ceiling. Dancers are constantly checking their positions — all positions, all the time.